Last week, we began a new section for the Grand Rapids People’s History Project, entitled Lies Across Grand Rapids. The purpose behind this part of the larger project is to provide a critical look at historical landmarks and how they can perpetuate hegemonic narratives about this community. Hegemonic narratives serve multiple purposes. First, such narratives are an attempt to tell history from the point of view of those with power and privilege. Most of us are familiar with such narratives, since US history is generally taught as the chronological high points of people in power, such as presidents, capitalists and philanthropists. Hegemonic narratives, by their very definition, also omit or marginalize the voices of those who have resisted the exploitation and oppression of those in power – Indigenous people, slaves, abolitionists, workers, women, immigrants, queer identifying, etc. However, there is a third consequence of hegemonic narratives. If we are told history through a narrow lens and don’t hear the voices of those most marginalized, then our ability to creatively imagine new narratives about present day systems of power will be significantly limited. For radical historians like Howard Zinn, the point of doing a People’s History, is to not only come to terms with history from below, but to help us frame how we view what is happening in the here and now. For those who have visited the Grand Rapids People’s History Project site, it is clear that the work we have done does not follow some chronological script. Projects areas are undertaken based upon information and research we have come across, input from supporters and inspiration from other people engaged in People’s History work. 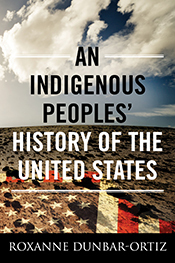 One important example of this work is Roxanne Dunbar-Ortiz’s book, An Indigenous People’s History of the United States. Dunbar-Ortiz does not write an exhaustive account of the ways in which native lands and native people were plundered, rather she gives us the framework for a new narrative how the history of the US. The primary analytical point that the author makes is that the US was founded on an ideology and practice of settler colonialism. For Dunbar-Ortiz, we cannot talk about the US, past or present, unless we come to terms with the ongoing legacy of settler colonialism. Such a reframing of the narrative is indeed radical, but it is ultimately necessary of we are serious about how we read and make history now. Using the important analysis of Dunbar-Ortiz, one can see how Grand Rapids is the result of settler colonialism. Indigenous communities existed here for centuries before European colonizers came to West Michigan. This fact is usually noted in Grand Rapids history books, but only enough to merit a few pages. While it is true that the level of violence against Native people, in what is now called West Michigan, was not as overt as was done to Lakota or Sioux nations, the violence was real and systemic. Lydens’ commentary is instructive, since it not only limits any understanding of violence, it ignores how settler colonialism functions. The reality is that thousands of indigenous people lived along the Grand River prior to the European invasion. Most in these native communities experienced displacement by force, religious colonization, the flooding of their communities with alcohol and displacement through legal maneuvers known as treaties. 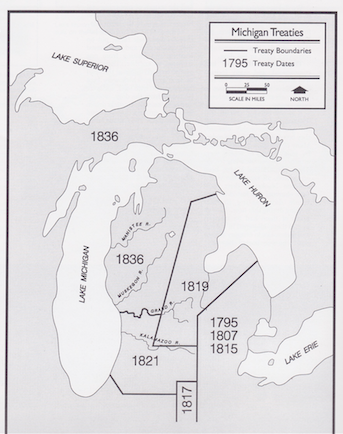 There were numerous treaties that resulted in the takeover of Native land by settler colonialists throughout what is now called Michigan (see map above), but settler colonialists have a long history of violation of those treaties. In terms of what this meant for Native people who lived along the Grand River in what is now Grand Rapids, many of them fled to areas in the Great Lakes that in the first half of the 19th century gave them a better chance of surviving settler colonialism. Beyond these few references to Native people in the area, little is written about them again in most history books about Grand Rapids or West Michigan. The near omission of Native life in this area is not surprising, since the limited references serve the hegemonic narrative about the “origins” of Grand Rapids. If we acknowledge that a whole community of people were here and then forcibly removed through a variety of means then we are more likely to have to come to terms with the real foundations of what constitute Grand Rapids. Such a reckoning might even influence how we organize ourselves today, with the possible delegitimization of the current systems of power that need the hegemonic narrative to justify the ongoing development and progress in Grand Rapids. To counter the hegemonic narrative, it is our intent to conduct interviews with local Native historians to allow them to share their rich tradition of not only how they remember the European invasion, but what their oral tradition tells them about what life was like before the waves of settler colonialists occupied their land. This entry was posted in Indigenous Resistance, Lies Across Grand Rapids and tagged hegemonic narratives, Michigan Native Treaties, native history in Grand Rapids, settler colonialism. Bookmark the permalink. Where did the map of burial grounds come from, and where did the information for the map come from. Belknap mentions the destruction of the mounds in his book, Yesterdays of Grand Rapids. 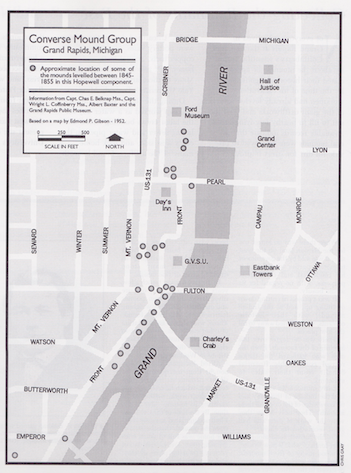 The map and the information about Belknap was cited in the piece coming from Gordon Olsen’s book “A Grand Rapids Sampler,” which does include an excerpt from Belnap’s book.